The European data protection regulations (GDPR) require that a number of API calls which are currently accessible to the public be modified so that they are either only accessible to logged-in users, or produce reduced output when the user is not logged in. 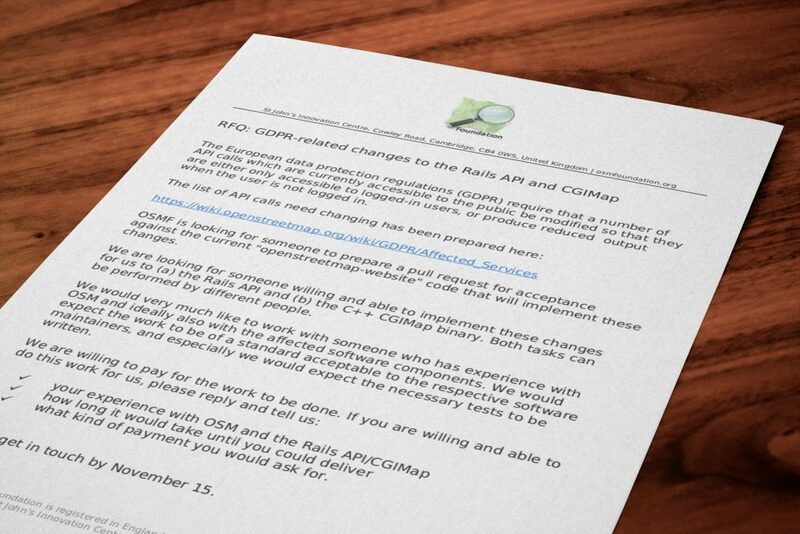 OSMF is looking for someone to prepare a pull request for acceptance against the current “openstreetmap-website” code that will implement these changes. We are looking for someone willing and able to implement these changes for us to (a) the Rails API and (b) the C++ CGIMap binary. Both tasks can be performed by different people. We would very much like to work with someone who has experience with OSM and ideally also with the affected software components. We would expect the work to be of a standard acceptable to the respective software maintainers, and especially we would expect the necessary tests to be written. what kind of payment you would ask for. Please get in touch by November 15. Update 20th December: the call is still open and we welcome expressions of interest. This entry was posted in OSMF on November 3, 2018 by OpenStreetMap. If you have followed the State of the Map news, you will know that OpenStreetMap Belgium has become the newest Local Chapter of the OpenStreetMap Foundation! “OpenStreetMap Belgium started as a tiny group of mappers doing meetups. Over the years more and more people started showing up and with the increasing usage and visibility of OpenStreetMap it was time to start organizing ourselves better. The invitation from Open Knowledge Belgium to join them as a working group, giving us the structure we needed without all the overhead, came at the perfect time. From then until now we have been actively supporting OpenStreetMap by co-organizing FOSS4G Belgium, the Open Belgium yearly conference, meetups, mapathons and many other OSM related events. This all escalated a bit with the organizing of SotM in 2016, which was a great boost for our community. 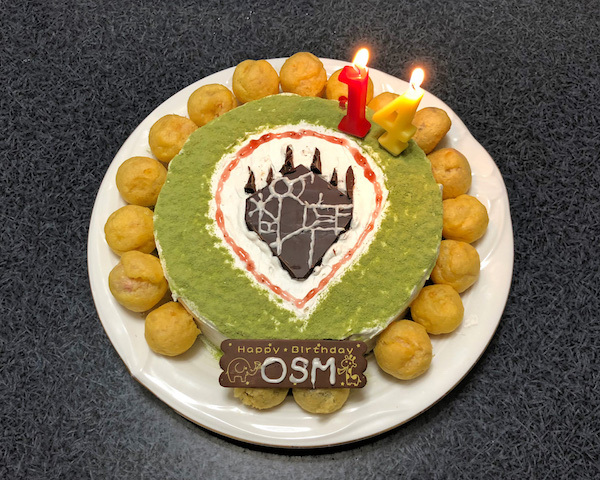 We are very happy to be able to join the OSMF as a local chapter and we hope we can have continued positive impact on the OpenStreetMap project both on a local level and internationally. Are you interested in establishing a Local Chapter? You might want to check the OSMF website and join the Local Chapters mailing list. This entry was posted in Local Chapters, OSMF on October 23, 2018 by OpenStreetMap. This year, OpenStreetMap reached the milestone of 1 million map contributors. Did you hear about the amazing sessions and everything interesting happening at the State of the Map conferences happening across the globe? This community is growing — what will make this journey better? YOU being a part of it. We’re running a membership drive from now until mid-November. Sign up now. We are already 800 members worldwide! You can help by liking, retweeting, or spreading the word about the Membership Drive to friends or at local events/conferences. Keep OpenStreetMap’s servers running: OpenStreetMap is the world’s biggest user-generated map, free for everyone to use. 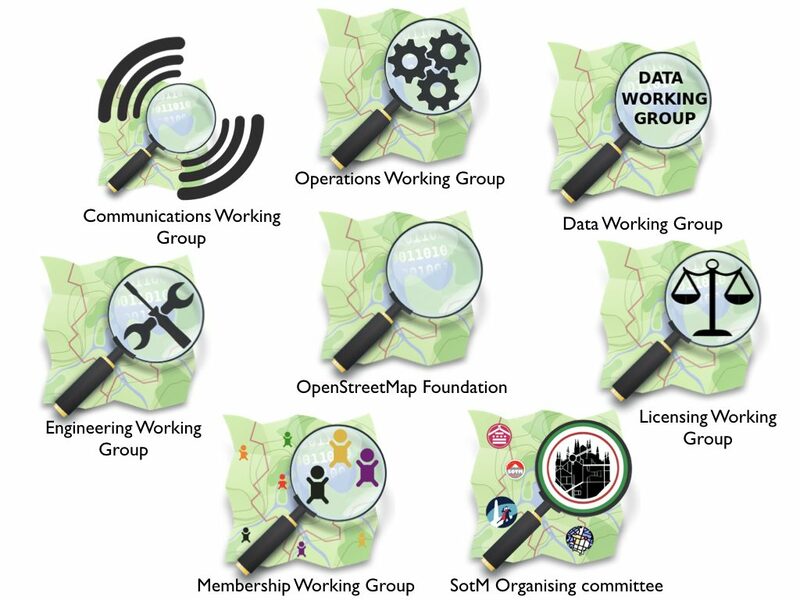 Support our volunteer working groups: Our Working Groups keep OpenStreetMap safe from vandalism and legal threats, resolve licensing issues, organise conferences, keep our hardware and software up to date, and many other things. Enjoy discounts to OSM events: The annual State of the Map conference offers significantly cheaper prices for OSM Foundation members. Show your support for OpenStreetMap. What are the things that I could do once I become a member of OSMF? You’ll have an official voice in the governance of the Foundation — the organization which owns and maintains the servers, holds the license, runs the State of the Map, coordinates local chapters. Influence the future direction of the project. Vote in the annual OSM Foundation elections for the board that steers the project. I’d like to join but there’s currently no suitable money transfer facility for me? A membership fee waiver policy will be implemented soon – stay tuned! This entry was posted in OSMF and tagged OSMF on October 3, 2018 by Jinal Foflia. This entry was posted in Uncategorized on September 12, 2018 by OpenStreetMap. We have a new Tile Render server in the United States! The hardware has been kindly provided by OpenStreetMap US and hosted by the Oregon State University Open Source Lab. Big thanks to them, and to Ian Dees who coordinated this response to the Operation Working Group’s request. Our distributed tile serving infrastructure brings the “standard” map tiles to your browser wherever you are in the world in a reasonably fast fashion, resulting in a pleasant map viewing experience on the OpenStreetMap.org front page, and with new map edits reflected a few minutes after they are made. It should always be noted that this is far from the only way of using our maps, and we encourage developers to take our data, render it, and otherwise make it available to users in a new ways. However, we do like the front page map to work well. We have a set of “rendering” servers doing the hard work of creating and refreshing raster map tiles, and a larger set of caching servers. With the introduction of a new rendering server in the United States (the first outside of Europe) tiles will load faster. 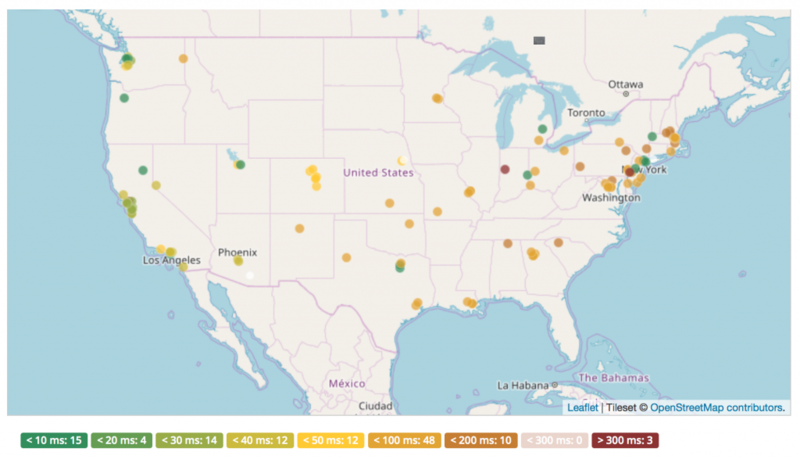 The server itself is fast, and for users in the United States we expect to remove about 100 milliseconds of latency for people viewing the map. Details of this new server (which we’ve named “Pyrene”) can be found on the hardware.openstreetmap.org site. We’re still building our tile serving infrastructure, with a lot of help from people and organisations donating resources. If you are in a position to help with this sort of thing, a caching server – or better yet a rendering server – in India would make a huge performance improvement for people there. Learn more about the kind of servers we need at our wiki page and contact the Operations Working Group. This entry was posted in Operations on September 5, 2018 by HarryWood. Earlier today news surfaced of various online maps displaying an anti-semitic term instead of the label “New York”. Unfortunately we have to confirm that this data originated with our editable map project. This vandalism was detected and fixed within 2 hours, and the vandal was blocked from contributing further to OpenStreetMap. On behalf of our organisation and community, OpenStreetMap condemns this kind of antisemitic hate speech without hesitation. We are disappointed that our project, which is devoted to sharing knowledge, was turned into a vehicle for the expression of ignorance, and hate. How did it happen? Part of the “Open” of OpenStreetMap, is being openly editable. It is a wiki-style, crowd sourced, collaboration in which users all around the world can contribute and make edits. As with wikis, like Wikipedia, all changes are published immediately, and we put tools into the hands of our community to monitor each other’s changes and revert vandalism. This “soft security” approach may sound surprising, but over the years we’ve found, as something of a triumph of human nature, that the vast majority of editors want to come together to help build something great, and these massively outnumber the few bad apples. OpenStreetMap is a not-for-profit good cause, and the map data is “owned by” the community. On the whole people tend to have respect for that. 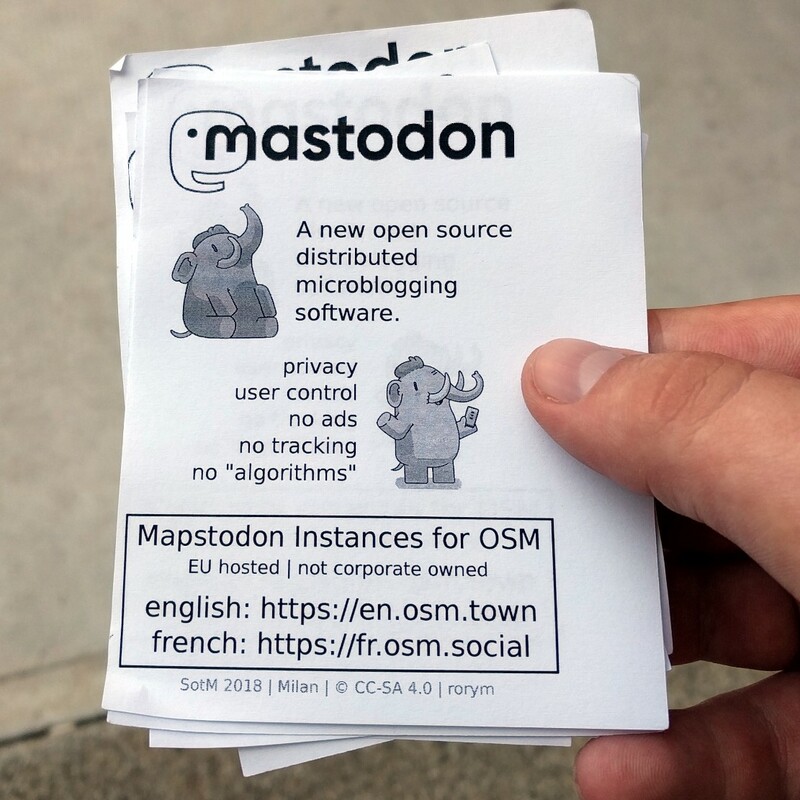 In fact this vandalism happened a month ago, but delayed processing of data updates by some companies downstream, in this case Mapbox, which presents our maps to thousands of apps and websites –means that this vandalism was seen quite widely today. Mapbox has posted their response to the incident here. There is on-going work within the OpenStreetMap community to develop better quality assurance tools, to detect and deal with this sort of issue faster. Mapbox has been spearheading these initiatives both in terms of developing vandalism detection software, and committing staff toward the efforts of monitoring and reverting bad edits. Unfortunately human error in their processing pipeline led to this incident in OSM-based maps that Mapbox provides to companies like Snapchat. If you see vandalism on our map, you can help. Read more about vandalism here. We will continue to work with our community and data consumers to make our map even stronger. This entry was posted in OSMF on August 30, 2018 by OpenStreetMap. 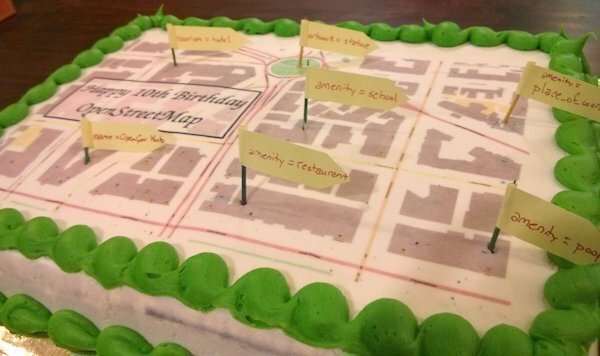 OpenStreetMap is 14 today! We’ve been partying in various locations around the world: Hyderbad, New Delhi, Moscow, Kigoma, Rapperswil, London, Washington DC, Denver, and Seattle. If you missed the birthday party, don’t worry. Our community is lively with events happening all the time. You can see some of them listed on the current events list here, or find out more generally what’s happening in your country/city on the wiki. The true “Birthday” of OpenStreetMap is lost in the sands of time. 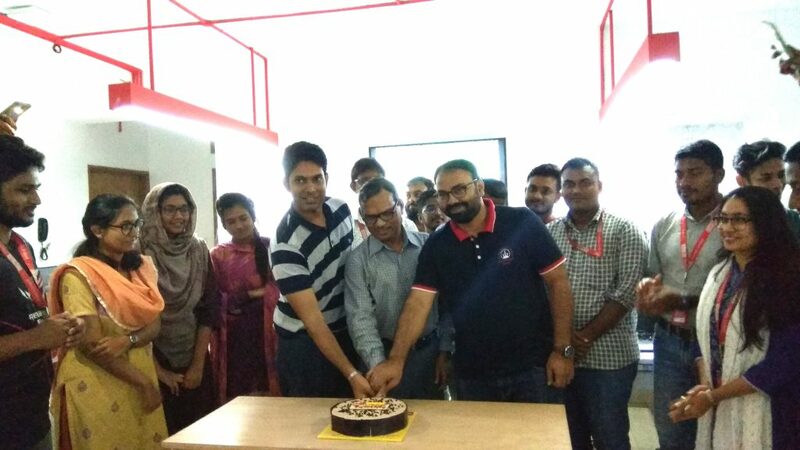 Observance of the anniversary of the creation of OpenStreetMap is held on or about the anniversary of the registration of the OpenStreetMap.org domain name (9th August). This year 12th August seemed like a suitable Sunday! This entry was posted in fun on August 12, 2018 by HarryWood. The Core Systems Award went to Sarah Hoffmann who leads the development of nominatim, the open source search tool. The Innovation Award went to Wikimedia Foundation Collaboration Team who have developed an impressive mapping stack for the Wikimedia projects, including features like the map internationalization. The Influential Writing Award went to Christoph Hormann who has been examining many mapping style choices, enlightening us on satellite imagery processing and generally sharing his opinion on mailing lists and the blog. The Greatness in Mapping Award went to Tshedy The work of Tshedy (Mats’eliso Thobei) is well known in the OSM Community. She is popularly known as “Lesotho Mapping Queen”. She is an avid writer, trainer, and mapper. The Expanding the Community Award went to Christine Karch. Christine who is a part of the State of the Map Working group has contributed in expanding both the developer and the general OSM Community worldwide through hack weekends and other events. The Improving the Latin America Award went to Natalia da Silveira Arruda, a professor at the University of Antioquia (UdeA) who runs a Youthmappers chapter at the University in the city of Cartagena de Indias/ Colombia. So far this has trained >200 students. The Improving the Africa Award went to Crowd2Map Tanzania, a volunteer-run mapping project that unites over 2000 remote mappers worldwide with over 600 community mappers on the ground in Tanzania. Since 2015, they have mapped schools, hospitals, roads, buildings and villages across rural Tanzania. The Improving the Asia Award went to State of the Map Asia 2017 organizing team who successfully brought 200 open mapping enthusiasts from Asia and beyond to this conference held in Nepal. The Ulf Möller Memorial Award went to Richard Fairhurst. He is a longstanding shining light of the OpenStreetMap community, and developer of key software such as the Potlach editor, an entry point to OpenStreetMap for many. 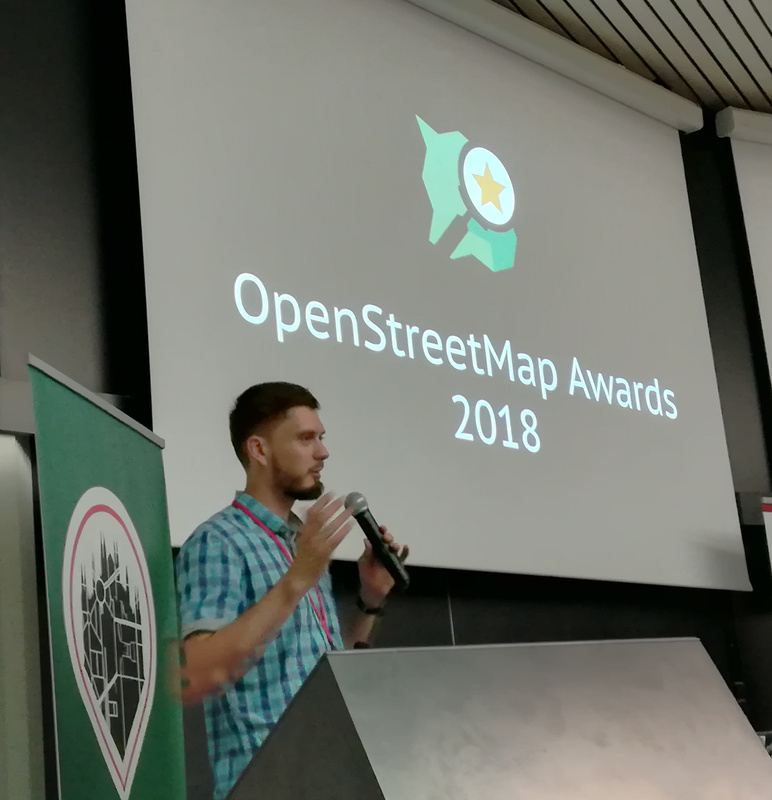 We congratulate all the award winners and everyone else whose hours and hours of contribution have made OpenStreetMap the map it is! Finally thanks to Ilya Zverev for his hard work in running the awards, and thanks to all those who nominated and voted. Please continue the good work, and prepare to nominate each other for the next year’s awards! This entry was posted in State of the Map on August 11, 2018 by Jinal Foflia. 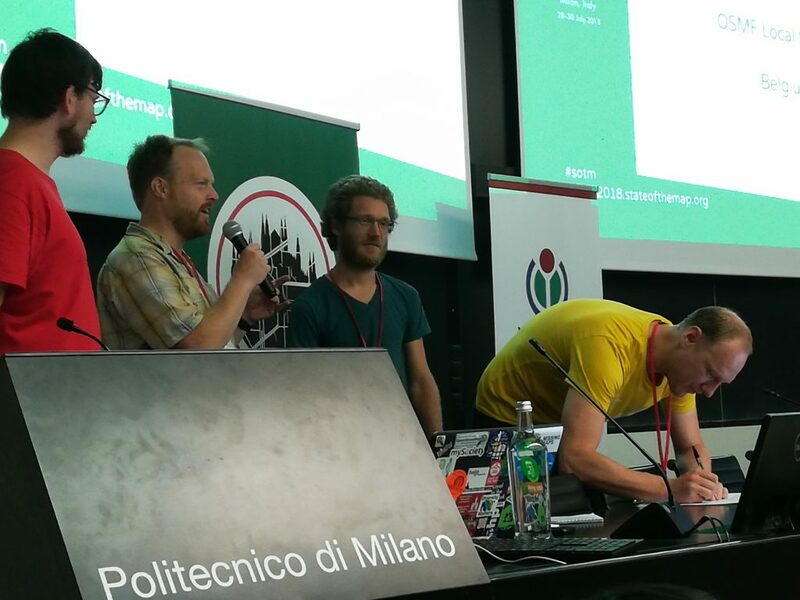 SotM Milan – Thanks for coming! 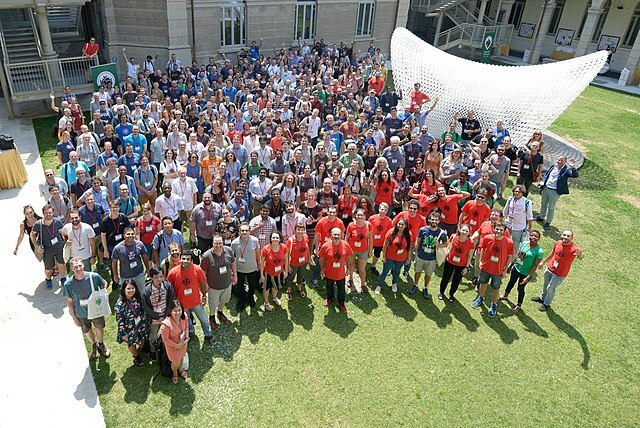 With over 420 attendees from 54 different countries, the OpenStreetMap community came together in Milan, Italy, for another fantastic annual State Of The Map conference at the weekend. Thank you to everyone who made it to Milan. …and of course a big thank you to the organising team for putting so much work into making the conference the huge success it was. 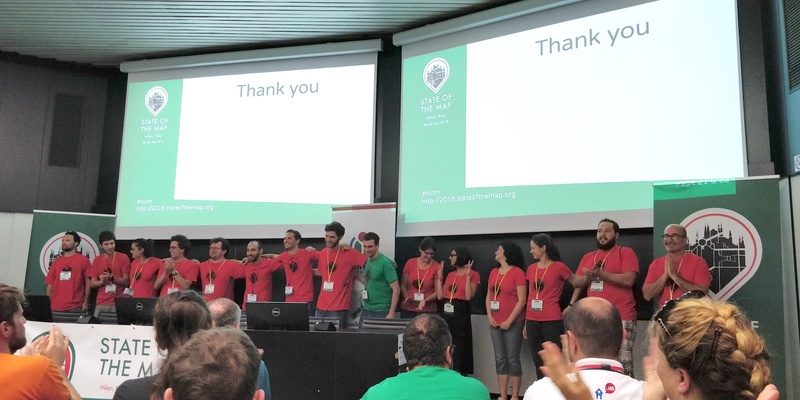 The SOTM organizing committee is composed of the international organisers: Benoit Fournier, Christine Karch, Gregory Marler, Mikel Maron, Rob Nickerson, & Michael Reichert and the local team in Italy: Alessandro Palmas, Alessandro Saretta, Francesca Ussani, Marco Minghini, Maria Antonia Brovelli, Maurizio Napolitano & Michael Montani, and a wider team of volunteers who joined in to help the event run smoothly. Thank you all! Day 1 (Fri): De Donato S.0.2. Day 2 (Sat): De Donato S.0.2. Day 3 (Sun): De Donato S.0.2. There’s lots to talk about from the conference, including several other announcements which will be coming soon here! This entry was posted in SotM-ru on August 1, 2018 by HarryWood. Some of our servers are moving to a new home. 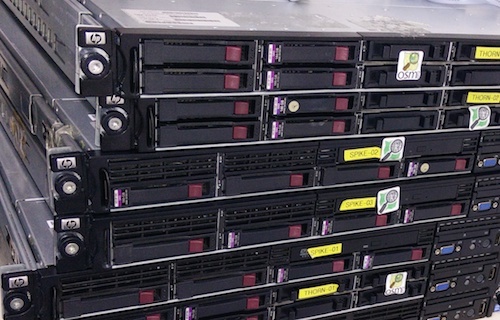 Quite a few of our important servers have been housed at Imperial College in London for the past few years, but it’s time to move on from there as they look to reclaim some space for offices. We’d like to thank Imperial for our time together! We continue to be thankful to University College London, and Bytemark who are still generously providing hosting for some other keys servers, not to mention our many Tile Cache hosts around the world. If you’re interested in server details you can see the full list on our hardware page. That list is set to change very soon, as Imperial machines are powered down and moved. The move is being carried out this week by volunteers from the OWG/OSMF. Where are we moving these servers to? We sought proposals for a new home (thanks to all those who replied), and Equinix Amsterdam has been selected as our new data centre provider. This brings a little more diversity of locations for our servers (many of the others being in the UK), but it’s still not a million miles away, in case our operations team need to visit. Equinix Amsterdam provide excellent “smart hands”, removing the need for physical visits on a regular basis. That being said, the Operations Working Group are seeking someone to help in Amsterdam who can visit the data centre if we need. To quote the OWG folks this volunteer would “need to be trusted, competent and did I say trusted”! 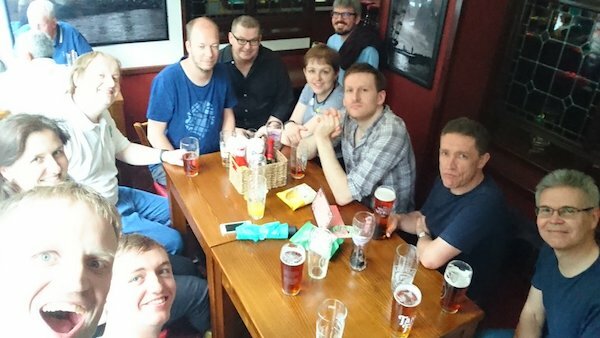 As ever, we owe a big thanks to OWG volunteers for all the hard work going into managing these server moves. This entry was posted in Operations on July 25, 2018 by HarryWood. Spend a Summer of Code with OpenStreetMap!